Waterfront properties around the world are usually limited and exclusive. However, Dubai has changed all that by adding hundreds of kilometres of coastline, artificial lakes and canals. “Being waterfront is predominantly about the views. Whenever we as a developer get a waterfront property, we design the building [in a way that] is conducive to what the plot has to offer,” Niall McLoughlin, senior vice-president of corporate communications at Damac Properties, tells Property Weekly. 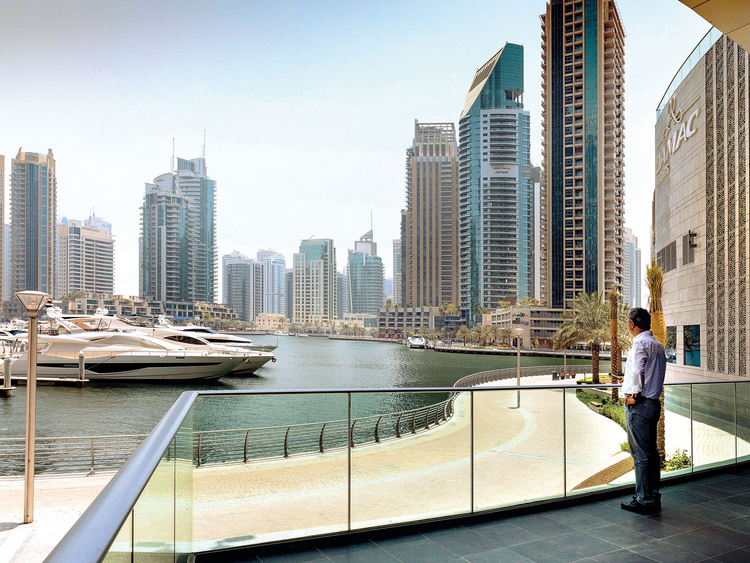 Apart from the views, waterfront living in Dubai encourages residents to be more socially and physically active. “We can go outside for a walk by the promenade, but we also have a nice TV room, which we can use when we want to stay in and host people for a movie,” says Adel Sheni, who purchased an apartment in Damac Heights, one of the newest additions to Dubai Marina that was completed only in July. Abbar, cofounder of digital content platform 7awi.com, lived in the US and France for 20 years before relocating to Dubai in 2010. He rented a three-bedder in Emirates Crown for Dh180,000. Over the next 18 months, his rented unit got sold twice, indicating the market was picking up. Emirates Crown, a 63-floor tower developed by Bin Shafar Holding, is located across the street from the Dubai International Marine Club and is a popular choice for yachting enthusiasts. But soon, it won’t be the only one. New yachting hubs are emerging, most prominently the 81-berth oyster-shaped marina in Dubai Creek Harbour that’s set to open early next year. Dubai’s newer waterfront developments are also starting to reflect the look and feel of waterside living in their architecture. This is notably different from the older developments that lacked a beach-style or waterfront finishing, and strikingly different from the inland, more urban feel, says Fadi Nwilati, CEO of Kaizen Asset Management Services, whose clients include Emaar, Nakheel and Meraas. “Some of new waterfront developments on the Palm and Dubai Marina have a completely different finishing style than anything else we are used to in Dubai,” says Nwilati. Generally, waterfront properties are priced at the upper end of the spectrum, but buyers are ready to pay more for waterfront views, Ozan Demir, director of operations and research at Reidin, tells Property Weekly. “We have seen that prices are between Dh1,000 and Dh2,000 per square foot in Meydan, Mohammad Bin Rashid City or Dubai Water Canal projects and rise up to Dh5,000 in Dubai Marina,” says Demir. “Investors have a great chance in selling the property at a prime rate, plus waterfront homes are likely to be rented more quickly.” To cater to demand from buyers with limited budget, Demir says some developers are also creating artificial lakes to give an urban waterside view to their properties. Despite the high price tag, waterfront homes continue to garner interest from end users and investors. Damac Heights, which is almost sold out, has seen buyers from Europe, Russia and the GCC. Whereas Emaar Beachfront recorded nearly Dh1 billion in sales at the launch of the first residences earlier this year. Recently, Chinese investors have taken a keen interest in Dubai’s waterfront projects, notes Abdul Kadir Faizal, co-founder of digital real estate platform Smart Crowd. One company, Fidu Properties, has pumped $103 million (Dh378 million) into the Creek Harbour development. With such strong interest from buyers, developers are constantly on the lookout for waterfront locations. “We’re always looking for prime waterfront developments,” says McLoughlin. “Our most exciting one now is in Oman, where we’re working with the government on the redevelopment of Port Sultan Qaboos.” Damac is also working on several waterfront projects in Dubai, including Maison Privé, a two-tower hospitality project on Dubai Canal that should be completed this year. According to Reidin, new residential supply is mostly coming from the Dubai Canal, transforming Business Bay into a key waterfront neighbourhood with 51 projects comprising 13,000 units. At Dubai Creek Harbour, 10 projects with 3,500 units are coming up. Waterfront living served as one of the main themes of last week’s Cityscape Global in Dubai with top developers announcing various beachfront projects. Meydan Group’s Marsa Meydan in Jebel Ali is by far the most ambitious with a planned climate-controlled boardwalk that will become a year-round outdoor destination. Dubai Holding also announced Madinat Jumeirah Living, a freehold luxury residential development located opposite the iconic Burj Al Arab in Dubai’s Madinat Jumeirah district. The project offers an opportunity for expat residents to be the first homeowners within the beachfront tourist district. Madinat Jumeirah Living will have a mix of residential clusters and will be directly connected to Souq Madinat Jumeirah via an air-conditioned pedestrian bridge. The project will break ground next year and developer Dubai Holding said the first phase is expected to be completed in 30 months. Marsa Meydan will feature a shading device that will cover the marina during the summer months to maximise its tourism potential. It will offer a combination of waterfront town houses and apartments, with “lifestyle options to complement every budget”, according to Meydan. AlJurf is a waterfront-themed project within the Sahel Al Emarat master development in Ghantoot between Abu Dhabi and Dubai. Featuring serviced residences and villas, AlJurf will include two marinas, a town centre, hotels, retail amenities and a wellness resort. Comprising three districts, AlJurf Gardens, Jiwar Al Qasr and Marsa AlJurf, AlJurf will have 3.4km of beachfront.